US orchestrated plans to topple Ecuador’s Rafael Correa continue. On August 17, Telesur reported disruptive elements attacked Ecuadorian soldiers and police with live fire. Eleven injuries were reported. Last week, violence rocked Quito. Dozens of police and several journalists were injured. 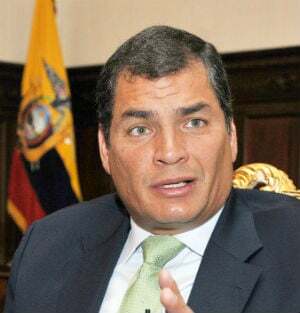 Correa blasted opposition elements trying to destabilize Ecuador. Ecuarunari (movement of Ecuadorian indigenous people of Kichwa nationality) leader Carlos Perez was videotaped encouraging violence. Attacks on police followed. Conaie indigenous leader Jorge Herrera called on National Assembly members to reject constitutional amendments being considered – including scrapping presidential term limits, letting Correa run again in 2017. Perez demands he resign. Correa enjoys strong popular support. He blasted both opposition figures for their disruptive actions. He said opposition groups turned to violence because their general strike called last week failed. It drew little support. This is very important to point out, for there to be a strike that means that you need to shut down factories, halt economic activities, but there was not a single strike in any factory in the country. Workers, business owners, people in the transportation sector, economic sectors did not go on strike. Expect no letup in US-orchestrated anti-Correa violence and destabilization any time soon. It remains to be seen what opposition forces plan next. Right-wing extremism doesn’t back down easily. Venezuelan President Nicolas Maduro expressed solidarity with Correa and Brazilian leader Dilma Rousseff – her country wracked by what analyst Joao Feres calls right-wing media orchestrated protests. Her supporters call demands she step down a coup plot. Washington’s dirty hands may be involved. Feres believes protests will fade. Support for reconciliation and dialogue are strong, he said. Maduro denounced “US imperialism (and national) oligarchies.” He accused them of “sabotaging” left and center-left governments throughout Latin America. He said Brazil’s far right “has not stopped conspiring against Dilma.” He ordered Venezuela’s border with Colombia closed in response to paramilitary violence – at least for 72 hours, maybe longer. He acted after paramilitaries from Colombia ambushed and injured three Venezuelan soldiers in Tachira state. “Enough of paramilitary terrorism! It’s time for justice for Tachira.” Its local government expressed support for border closure. Maduro has called on Colombian President Juan Manuel Santos to cooperate in cracking down on cross-border crime. Washington’s dirty hands are involved in all Latin American violent and destabilizing activities – part of US policy aiming to establish client states throughout the region.